HCT116 is a KRAS proto-oncogene mutant, used in colon cancer tumorigenicity screening studies. HCT116 is positive for transforming growth factor beta (TGFβ) 1 and TGFβ2 expression. HCT116 cells can serve as a metastasis model when orthotopically implanted or injected into the circulatory system via the tail vein1. Additionally, HCT116 cells have been used to study the importance of cyclin D1 for lithocholic acid hydroxyamine (LCAHA) activity. HCT116 cells have also been used to study the effects of transferrin on the uptake of fluorescently-labeled small interfering RNA (siRNA) within the polyethyleneimine (PEI)-siRNA complexes. 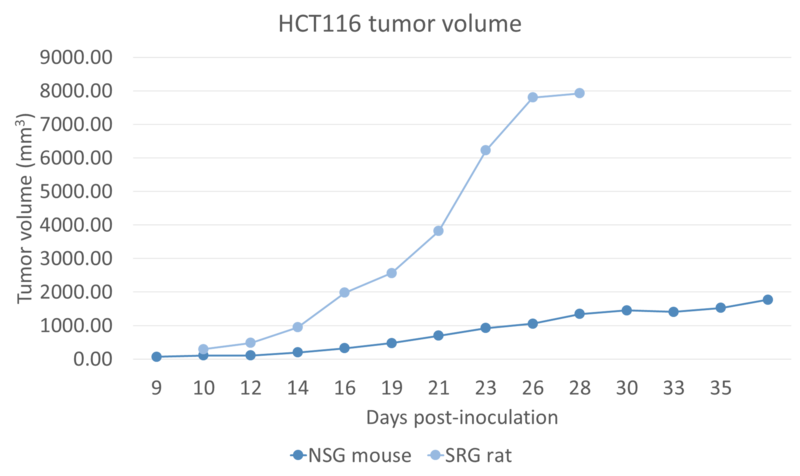 HCT116 cells formed xenograft tumors in the OncoRat with volumes over 5-fold greater than those in the NSG mouse. The OncoRat demonstrated a 100% engraftment rate for the HCT116 xenograft model, providing an ideal host for HCT116 tumor biology. The cells were inoculated in the flank region at a density of 106 cells per rat in a 1:1 solution of cell culture media and 5mg/ml Cultrex. Rajput A, Dominguez San Martin I, Rose R, et al. Characterization of HCT116 human colon cancer cells in an orthotopic model. The Journal of surgical research. 2008;147(2):276-281.